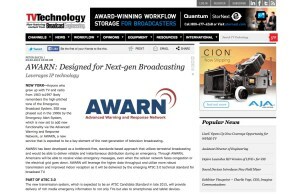 AWARN – the Advanced Warning and Response Network – is “the next generation alert and warning system for the mobile America of the 21st century.” So says TV Technology in a comprehensive article that highlights the momentum behind advanced alerting with the ATSC 3.0 broadcast standard. Of special interest to both the public safety community and broadcasters is the fact that “AWARN and ATSC 3.0 will integrate seamlessly with the federal Integrated Public Alert and Warning System, managed by the Federal Emergency Management Agency. Alerts generated by FEMA or state, regional, or local authorities already trigger limited broadcast and text alerts to be received by viewers and listeners,” according to TV Technology. Moreover, Suciu writes, the addition of AWARN Emergency Alerts means that devices equipped to receive AWARN signals can be easily triggered by IPAWS to display video, photos, audio and text alerts to a variety of specially-equipped devices. Broadcasters have extensive newsgathering and weather information already available to them such as remote pick-ups and Doppler radar.